It's hot. And by hot I mean searing hot, and the earth shows it. 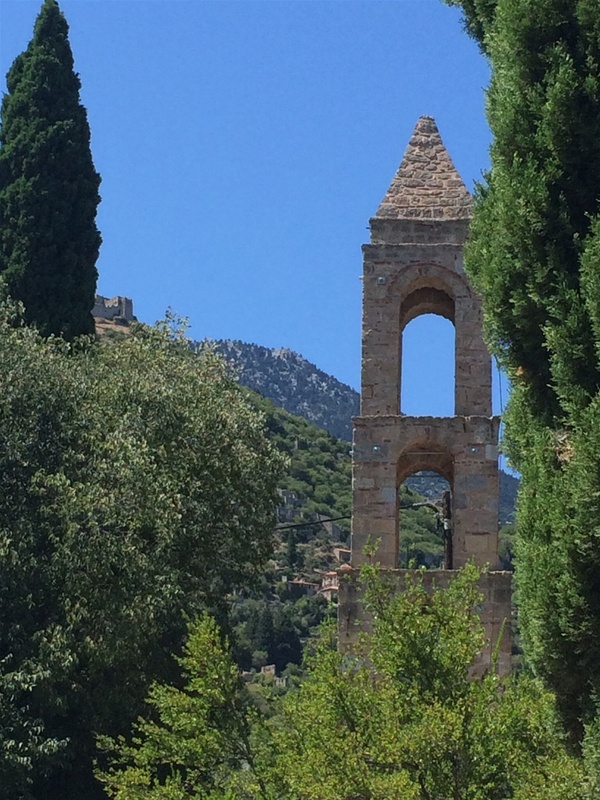 We are back in Greece, driving right now with Aris's Mom and Dad back from Sparta and back into the village of Petrina, whizzing by the dry, red hills populated with olive groves. We arrived back from Italy yesterday after a full day of travel from Rome into Athens, and then the drive to the village. The Traveler's Malady has stricken me, and I always worry it is a bacterial thing, but Aris insists it is due to travel and activity and heat, and too much rich food. I think I have to agree about the rich food! I am feeling better, almost 36 hours after it first hit me. 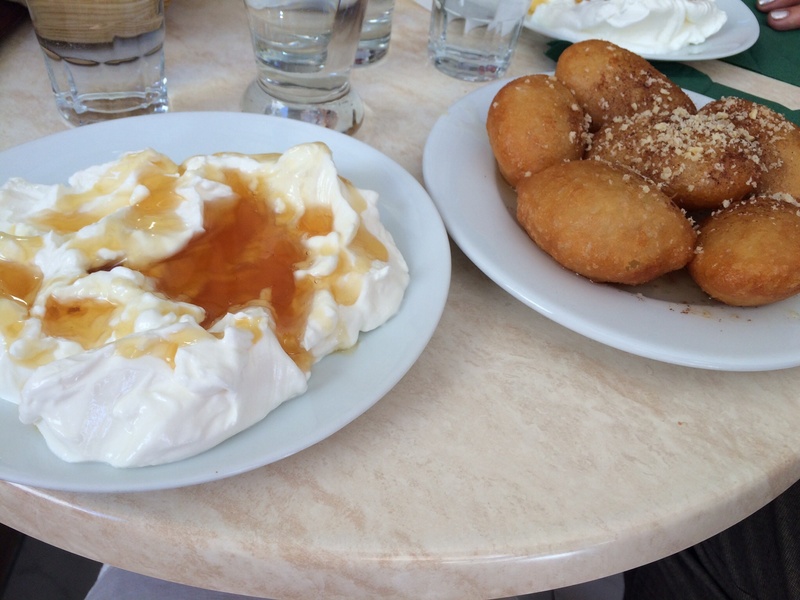 While stopping in Sparti to have some yogourt and loukoumades, (yes I took a photo because these are the real thing!) we ran into several people that Aris's mother knew. What a delight to see her face light up, in the familiar neighbourhood of her young life. I took her to the market and we bought some mountain tea, chatting briefly with Dimitra, the lady selling her goods on the corner, with no table to display her wares, simply in boxes and buckets on the ground. The actual purpose of our visit was so that Aris's Mom could visit some family and also visit the grave of her sister Eleni, who passed away only a couple of weeks before we arrived here. Eleni is laid to rest in a lovely cemetery, at the foot of the mountainside rising up to the South, where the ancient ruins of Mystra look down on her and will guard her forever. Her sweet husband of almost 70 years, Elia, now 90 years of age, seems sad but managed to be part of his old self, jokingly asking me to dance with him. There are people close by who will care for him now, no doubt. Up on the porch, the 38 degrees (translate that into about 95+ Fahrenheit) of Sparta has now become only 35 degrees in the village, but the breeze is heavenly. The metal railing was untouchable. This is the place to finally sit back and write about the last few days of our journey. Now, the mountain tea and a piece of Paximadi will do its part to settle my stomach, and we will skip the beach for the day. I left you last after our visit to Florence, where we were overcome by the size and the magnificence of the Duomo. But there was so much more! We wandered the streets in the evening and on one of those walks came across Ponte Vecchio, the bridge that is mentioned in Puccini's famous Aria, "O Mio Babbino Caro" and I noted to myself that in fact, this bridge would be pretty difficult to jump off of, because it is completely built up with little stores. In fact, the Cartier store right in the middle would be a great place to 'comperar la nello' (buy the ring). Nevertheless, it was a thrill for me to see this particular spot. After seeing The Statue of David the next day, we set out again onto the open road and headed through Tuscany to the City of Siena. Once again, an old, walled city waited to envelop us. We did not see the Tuscany countryside on our way, the way we thought we would see it, since it was mostly highway driving and there is a lot of industry alongside the highway, but once we arrived in this city, up high and surrounded by cliffs, we could look down on our stunning surroundings. The place of legends, Tuscany is indeed beautiful, rich in resources and history. I knew now, why the heart of an Italian is so passionate, and I thought to myself, if I was Italian, I could never leave this place. This is what every European who has ever emigrated must feel, and why they are compelled to return to their homeland as often as possible. While Canada offered a better future, there are just some things it does not have. 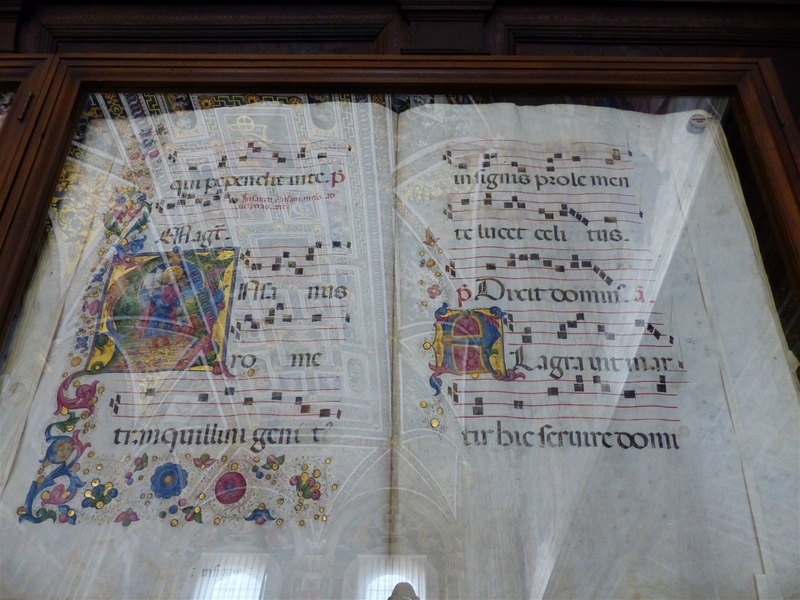 Siena was a wonderful experience, seemingly older again in its establishment than both Florence and Lucca. 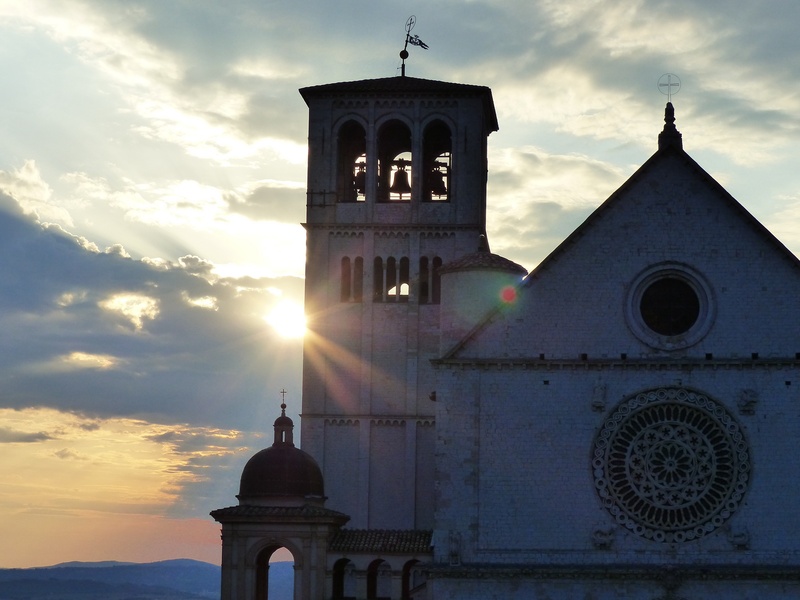 The next stop was Assisi, something that Aris had thought we should not miss. What we were starting to realize is that our travels seemed to be taking us on a pilgrimage, one that we never could have planned on purpose. We were seeing not only history unfold before our eyes, taking in the passage of time and the development of man's exploration and advancement from the Dark and Middle Ages into the Renaissance, but also, our eyes and minds were beholding and trying to grasp the growth of Christianity and of Catholicism (we are not Catholic so this in itself was mind-boggling to suddenly be exposed to all at once). The amount of pain and suffering that is depicted everywhere is something that I think our North American generation cannot fathom, especially when we relate it to a belief in God. We are of a generation that seems to not be impassioned by much, thinking only instead of our own comforts and belongings. We learned of a man who after his travels abroad and after having fought wars, he felt compelled (a vision from God, they say) to return to his hometown of Assisi, and there, he renounced all of his worldly possessions and chose to live a life of poverty, abstinence, and ascetics - St. Francis of Assisi is one of the most revered Saints to this day. Just standing in the Basilica named for him, and silently trying to understand what it all meant, made me wonder if any of us could ever do something like that now. I do often long for the simple life, and I was reminded of a man who raised me, who himself fought wars and had many a hardship, until he once again began to paint and could lose himself in the beauty of his art, and his music making and his philosophy. (He would tie up his pants with some handy string, and much preferred a cabin in Parry Sound that had no running water, heat, or electricity, to the city life.) Perhaps this is partly why, at age 50, that I long to be fully immersed in a life of music and to leave the corporate world behind. Maybe it was his teachings and way of life that make me feel the need to return to be closer to nature now. The town of Assisi was quite possibly the best location that we visited (except for the bed in the hotel we stayed at...but then again, St. Francis would have liked it that way!) While it still has many stores, there are no Prada or Versace stores like the other cities - here, you will find stores with Nuns selling religious items, and books, and artwork done by artists who are sitting right there, making their next item. It is not commercial feeling at all. I was delighted to see Cloisters that had Nuns from all over the world and in particular to come across a couple who were from a German Convent. What better place to prepare for a role in Puccini's Suor Angelica! 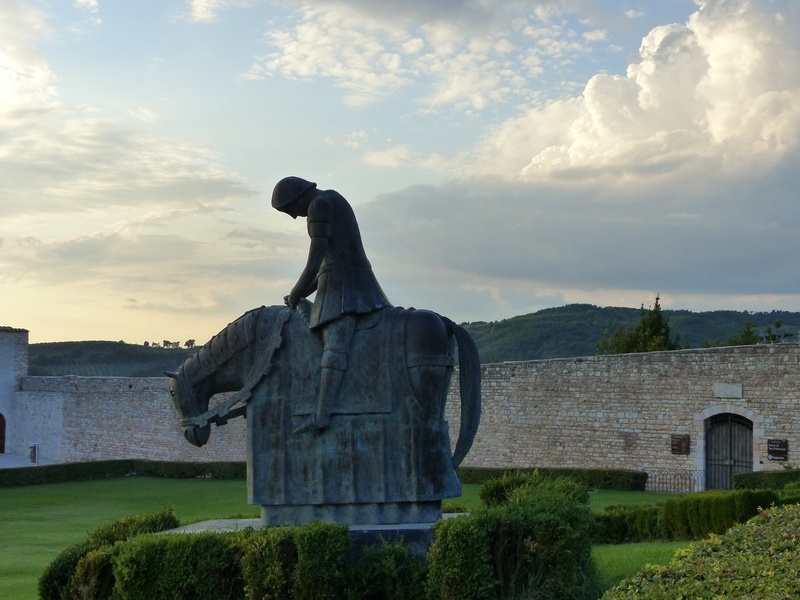 Our one dinner in Assisi was a beautiful experience, having happened by chance on a restaurant that had a cliffside patio and thinking, "We have missed a few sunsets, let's try to catch one here", we knew this was the place to stop. And what a treat we were in for, when all at once, at 8pm, every single church, basilica, and humble chapel, let forth peal upon peal of immense bells, chiming for several minutes, and at the same time, we soaked in the most glorious sunset of all time. We ordered wine and selected a pasta dish and a beef dish both which had truffles and truffle oil in them. We had not really known that Umbria (and Tuscany) were the place that truffles were found in abundance. I loved it, Aris not so much, finding the truffles gritty. More for me! Assisi is old. The cobblestones under our feet were polished with age and the pathways between buildings were even more narrow and steep than Lucca or Siena. The buildings leaned more precariously into one another, and looking down across the Umbrian countryside, THIS is where we truly felt that we were in the heart of Italy. The statues seemed older, many in wood or bronze, and more often renditions of Monks in simple burlap than Popes in their grandly embroidered vestments. I wouldn't tell people that I am particularly religious, but Assisi moved me, in particular when standing in one of the original churches that now resides under the grand basilica of San Rufino. The piped in music was an effective chant, echoing through the dimly lit arches and resonating in my heart. Wars have been fought, many have died, religion lives on in many forms, but man has not learned anything, it appears. On our way out of Assisi, I saw a sign that said "Petrified Forest" and I implored Aris to stop there. He thought I was joking but still took a turn off, and we ended up in a very small, walled village named San Gemini. We walked around for a bit and found a little restaurant and decided on lunch. A tiny place, a wood oven with a roaring fire, and the cutest little bathroom you have ever seen (rather like a hobbit's door) we had one of the best meals here! 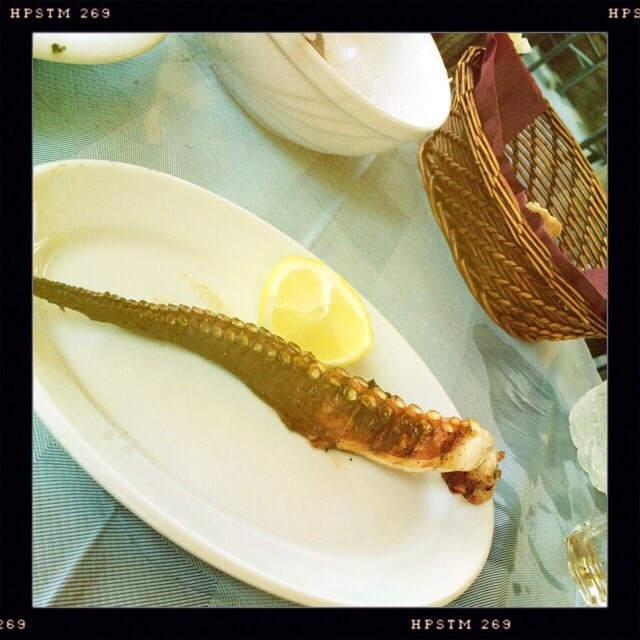 If you are traveling South on Highway A1 into Rome, look for San Gemini and stop in at Taverna del Torchio. 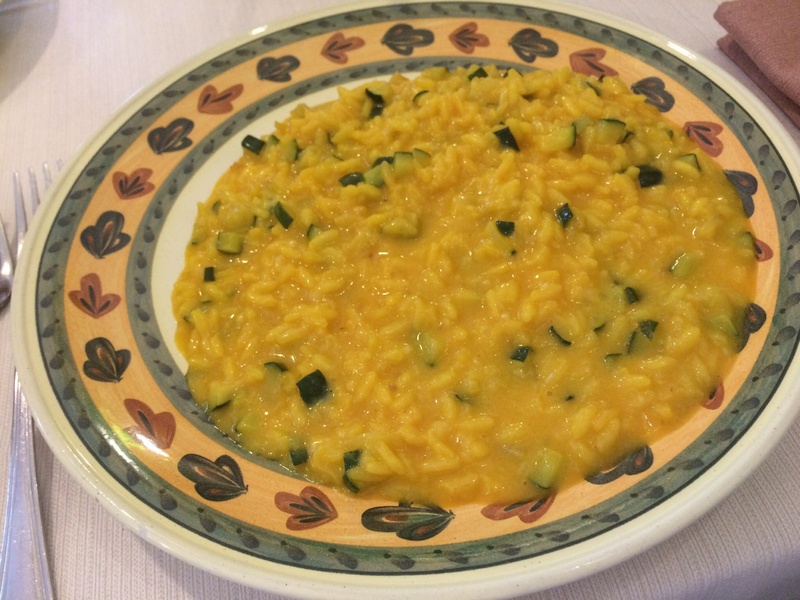 I ordered a Risotto with Saffron and Zucchini flowers, an amazing yellow sauce and so tasty! Aris had the local special, a long rolled handmade noodle with delicate meat, which was their Picchiarelli with mixed meta ragout. Service was top notch and they tried happily to help me with my Italian, as I wanted to know how to say "My husband causes me such problems"....because I wanted to find the Petrified Forest and it was not going to happen! ;) We didn't leave until we snapped that photo of Aris standing beside the tiny little truck, so perfect!! Leaving the countryside behind, we were soon to see where an Empire fell, and where the man's Homage to Christ in Glory would reach new heights. 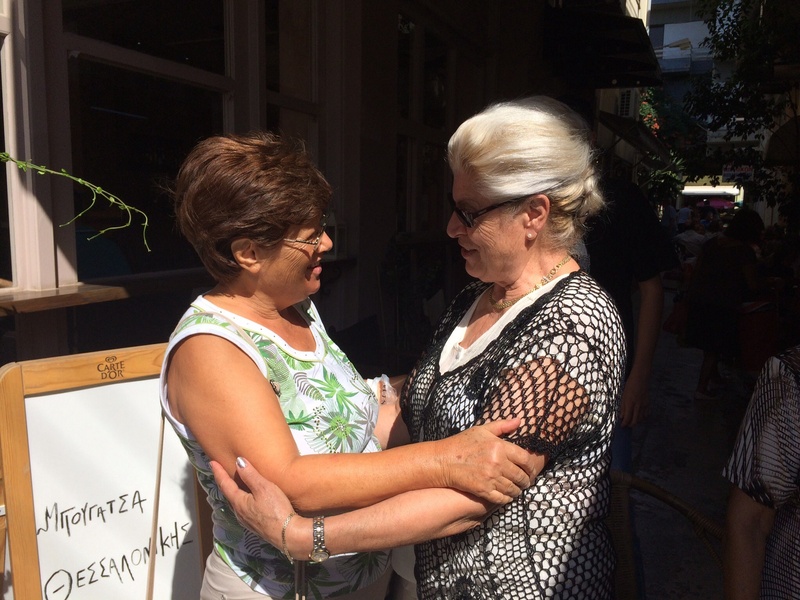 Aris's Mom greets Litsa, Theo Kosti's sister. The delicious Zucchini and Saffron Risotto! Entering Siena, we opted for a Hotel just outside of the Walled part of the city. A smart choice, as we soon found that inside the walls, they would cost more. We are really only a few minutes' walk away. First of all, if you wear heels in Siena, you are a ridiculous person! (Although I have seen plenty of silly women looking great trying to tiptoe through the stone streets, this is not going to be me.) This city is built on the side of steep cliffs, and almost every street has an incline. They wind and curve and slope and it is challenging yet incredibly fun to wander about here. Our first day, we explored the Campo where the famed Horse Races are, and just did a walk-about to get our bearings. The second day, we planned to visit the Cathedral of Saint Mary of the Assumption. 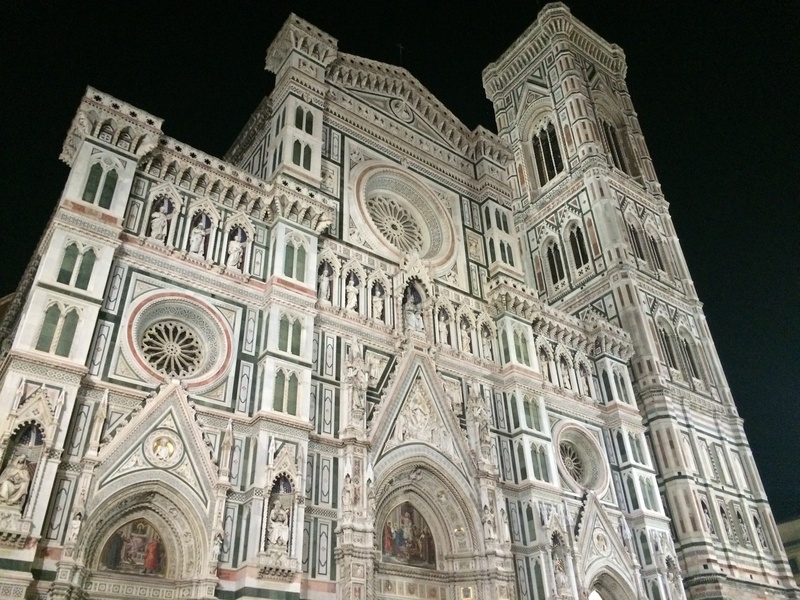 It is smaller than the one in Florence, but 100 times more ornate inside. The floor alone is something to behold! Again we climbed to the top of a structure where we could see the entire city, and again we were blown away by the magnitude of what was accomplished here. Walking about this afternoon, we found the leather store I'd been seeking that had the lovely tooled leather handbags and I knew if I didn't get it now, I would not have an easy time of finding it in Rome. So, a modest cross shoulder purse was selected, and with it, a matching wallet. Now Aris doesn't have to carry my stuff around! And I will carry with me, a piece of Italy's craftsmanship that speaks to the centuries of talent that have come before. This Cathedral is all about Mary, surrounding the Annunciation. The Museum is where you will see many of the original sculptures, frescoes, and wood carvings, along with a round window that was removed from the church just before World War II, in order to preserve it. 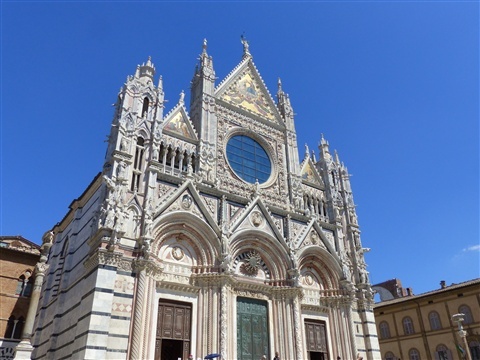 It is truly something to lay eyes on the restored facade of the front of the Church, where not only Mary is the focus, but you will also see Aristotle and Plato, lions and gargoyles, and gold leaf that is blinding in the hot Tuscan sun. People simply park themselves in front of it and it can be viewed for long periods of time without needing any words to be spoken. We explored the inside by starting with the Crypt. My Lord!! There is a Cathedral under a Cathedral! Only in the 1940's was this space apparently discovered. Next was the Baptistery at the back of the building. This space is so ornate!! The artwork is dedicated to St. John the Baptist and contains some incredible work by Donatello. But then, we stepped inside the actual Cathedral, and as our eyes adjusted, they were opened to the most wondrous application of art and design, not one corner left untouched. Huge paintings, skyscraping columns of black and white marble, and another dome to behold. The Library!! I did not know what I would see in here. In the church, we noticed what appeared to be a huge Lectern, but could not fathom what would be that large...until we entered the Library room and found it filled with incredibly huge books, depicting the MUSIC that was sung to the Liturgy, the Graduals and Antiphonarium which are the chants that dominate the Latin service. I still remember singing many of these in my time at St. Thomas Anglican in St. Catharines and I must say that I loved that we did the service with quite a lot of Latin involved. This Library visit was a highlight to me! Ahh, Florence! We have been in Siena now for a day and half and I'm thinking back to our final day in Florence - it's very hard to even remember details from two days ago, let alone from this morning! I will start by saying that we really feel as though we have done this right, by starting in Lucca. 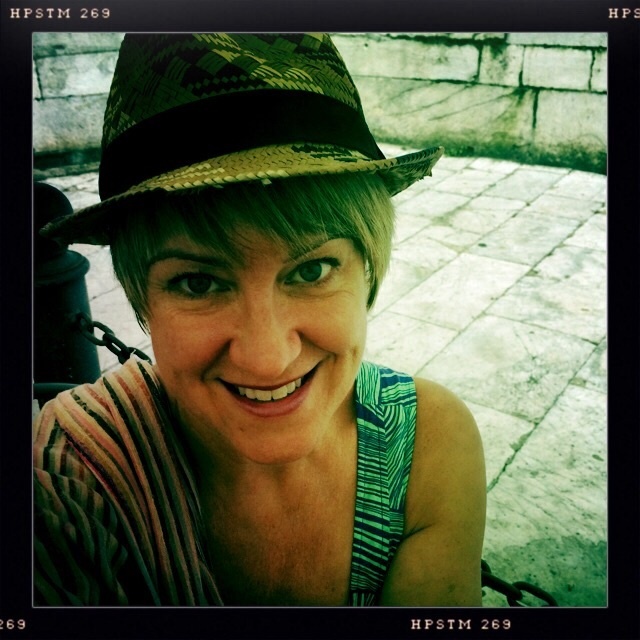 In doing this, we began our adventure in Italy in a very authentic way, no big city pandemonium, but rather, a quiet and slow paced introduction to all things Italian. I recall a trip from long ago that I often relate to people who say they are going to the Dominican Republic. If you plan to simply stay on the resort, you will miss much of what the Dominican really is. This is probably true for most countries and most resorts, although it some areas it can be advisable to stay on the resort. In the Dominican, my adventure was with Iguana Mama and it was a mountain bike tour. After being taken up the mountain in a van with a trailer full of bikes, we then cycled down the mountain, through coffee groves and villages, stopping at roadside vending stands and eating local food. Lunch half way down the mountain was in a Yoga retreat and we sat cross legged on the floor, eating food with our hands, out of banana leaves. I held a grasshopper in the palm of my hand...which was the size of the palm of my hand... and I saw the real Dominican, breathed the mountain air, and got a helluva lot of great exercise in the process. (I am not a cyclist and there were some pretty treacherous descents!!) Do this. Go to the outskirts, and experience the countryside, if you can. I am pretty sure Iguana Mama is still around. They do white water rafting as well as several other Eco-Adventures. After our quiet introduction in Lucca and not having too much ground to cover, Florence was a contrast. Our second day, we had tickets in hand and lined up early to gain entry to the Duomo, a 400+ step climb to the top of the dome, from where you can overlook the entire city and the surrounding countryside. Of course I had to find a washroom so I left Aris standing in line to hold our spot and I went wandering around the Cathedral to find a spot that would let me in. A young man at a small gelato place let me in, as he remembered me from the day before. Anyway, if you think the building is grand from the ground, it is even more so from above. Closer to heaven indeed! The stair climb was tough and the staircase was a tiny, winding one. Pretty soon, we were able to see the sides of the dome sloping away from us, from the inside of the double walled dome, red brick veneer lining the steep curved walls. 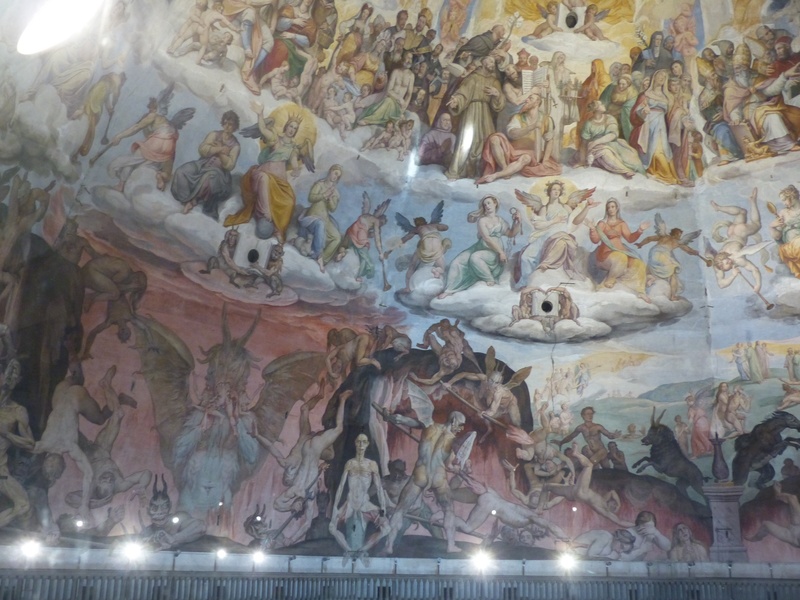 And then we popped out onto a deck inside the Sanctuary, just below the bottom of the dome, where we could see so much more detail of the painted ceiling. Thankfully, there was a 9' high plexiglass shield at the railing...but this made it a bit tough to take photos. Another winding stair case and a few more huffs and puffs, and we were at the top. A breathtaking view of Florence, and a fresh breeze, were our rewards. On the way back down, the platform that takes you to the exit staircase is even closer to the dome roof. This time, we could easily see all of the detail of the paintings. A cross section of the levels of Heaven, and the scene of the Last Judgment, it truly depicts the Divine, the cherubim and seraphim, the Saints and the Beatitudes, but below, the Depths of Hell await, with demonic creatures shown eating humans who were cast down, impaling and mutilating them before throwing them in the pit. The stuff nightmares are made of! Reminders to the pious that they must stay on the straight and narrow. It took 70 years to build this Dome, (140 for the whole Cathedral) and it was built in the 1400's. The painting was begun in 1572 and went to 1579. This is early Renaissance, just after emerging from the Crusades (1095 to 1291), when man tortured man because of his beliefs, and when the High Middle Ages began, and Christianity was beginning to sweep through Europe in a new, glorified manner... paintings with more LIGHT, massive monuments to the religion were erected, and new wealth was amassed, a rebirth. We deserved a cannoli after this effort!! We found our way back to the little cafe with the washroom I used and sat for a bit longer, marvelling at the marble walls in front of us. Then we began the search for the one store in Florence that sold the leather purses that I'd seen in Lucca and fallen in love with. In Lucca there were several and in Florence only one! We could not find it, and when we did locate it online, it was too far to walk. Our excursion led us to lunch, when we found a little spot tucked in a side street (it is across from the Astoria Hotel) and we had another fresh pasta extravaganza! 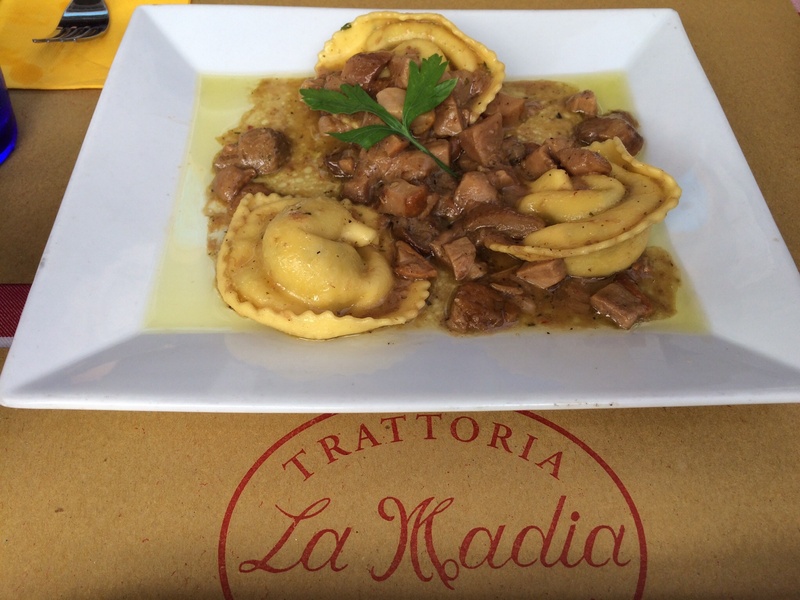 We were at Trattoria La Madia and thoroughly enjoyed our meal. 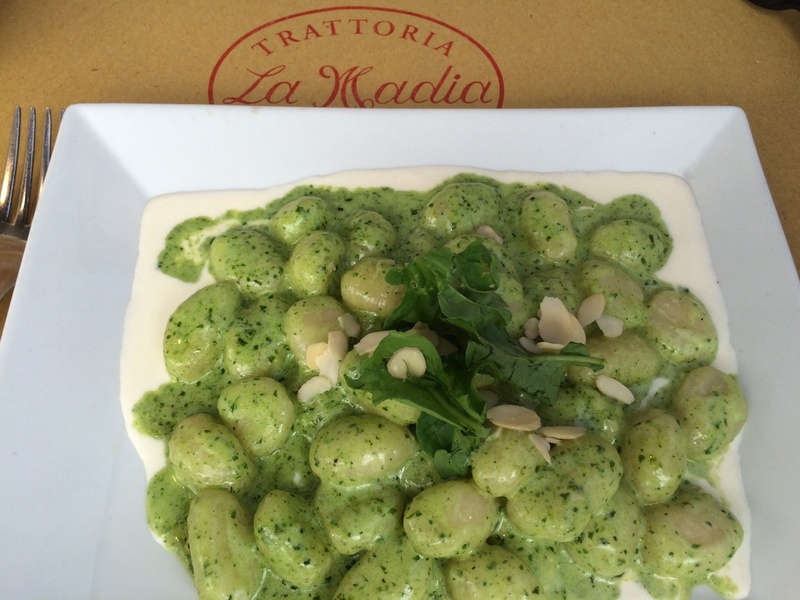 Aris's selection was the Ravioli, and mine, the Gnocchi with pesto and shaved almonds on top. The service was excellent, polite and with enough English to get by. The interior of the restaurant was nicely decorated and display cases with incredibly beautiful food, pastries, meats, and fish were highlighted. Our meal was about 30 Euros that day. Back to the Hotel, absolutely knackered, we rested and then headed out again, this time to see The David. Another divine creation by a great Master, he is truly one of the most magnificent works of art in the world. Of course, my husband says that he was actually Michelangelo's model, expanding on the reincarnation of Mozart story, but I'm not sure for which part?? 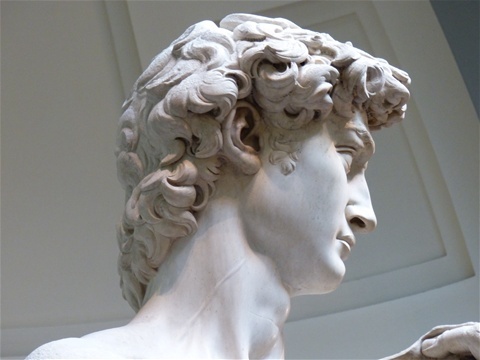 David's distinctly Italian features could be matched to my Greek God, ...I will leave it up to you to guess which part is the closest match. 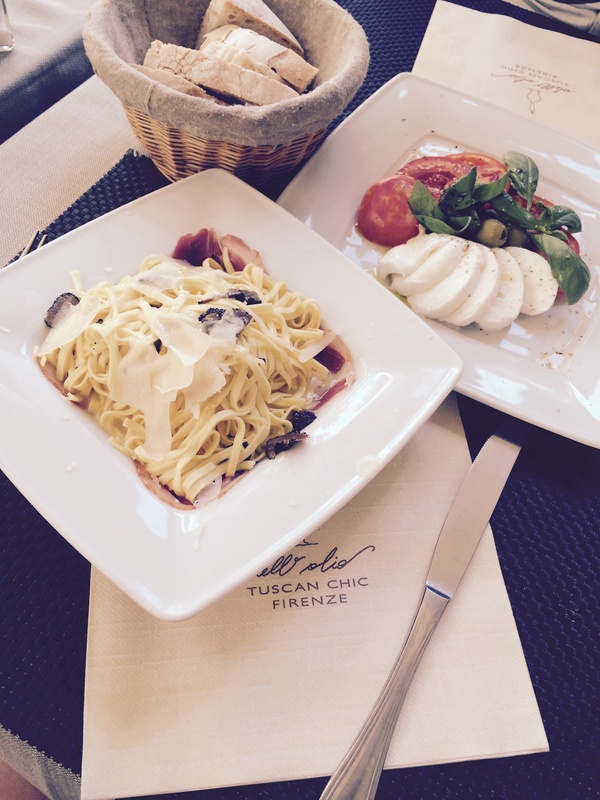 I will depart by sharing a few photos of the Duomo and of our lunch, to drool about. Italia, the first few days. This does not need a description! It is a 2 hour flight from Athens to Pisa, and it went by very fast, since I made a friend with the young lady who was sitting next to me. 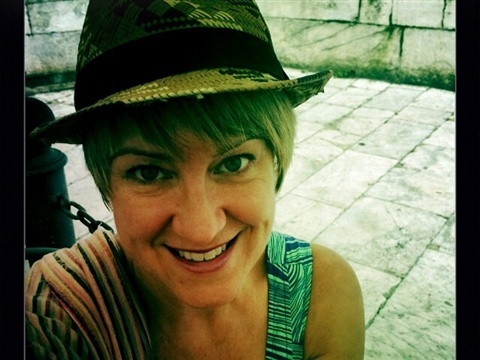 She was from Australia, but of Greek descent, and traveling to meet a family that she is a Nanny for, in Italy. Charming girl! Arriving in Pisa, we kind of milled around a bit, not finding the rental cars right away. Back inside we went...and then back outside. You basically need to hop on a bus that says Rental Cars and pray that it will take you to the right place. It did! And soon we had our little car. The lady from Avis was very friendly and helpful and could speak English very well. Here's the thing...for all the Italian I am learning to sing, I just cannot speak it at all ~ partly because I haven't spent any time learning it, and partly because the only words I know are from songs, and partly, because my mind is still filled with Greek words, and I tend to mix German and French in with THAT! I am one confused girl! I now desire to truly learn to speak Italian. Dealing since our arrival at the Athens airport with a plumbing problem back at our house in Markham, we had a frenzied passage through check-in, security, and boarding, poor Aris trying to make phone calls and send emails and make sense of the situation. Water backing up into the sink, and not a nice colour. Septic system not working properly... so far this year, it's been the furnace twice, and now this! All is resolved now; the septic has to be opened up and emptied/cleaned. Always when it is long distance, it's so crazy! 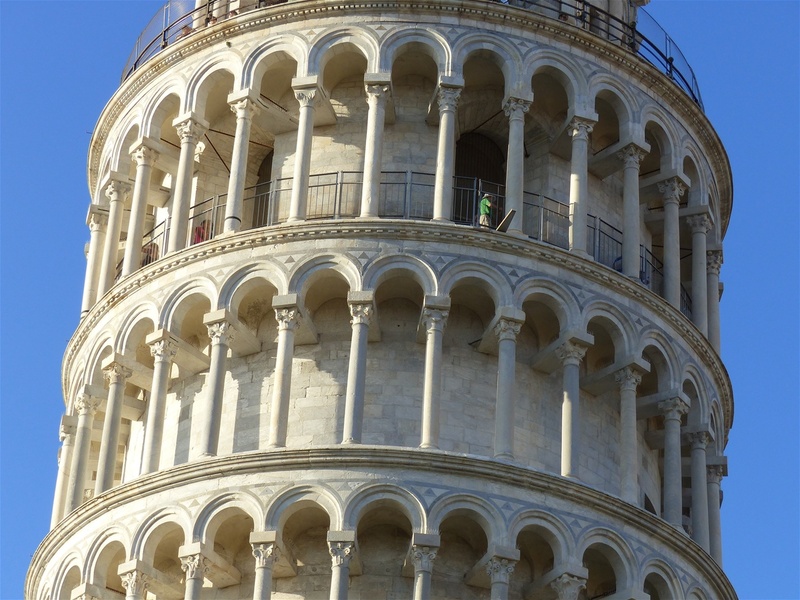 We were exhausted by the time we reached Pisa and wanted to head to our destination of Lucca, but not before we saw the infamous Leaning Tower, so round and round we went (a couple of times ending up in the same roundabout) until we found it. 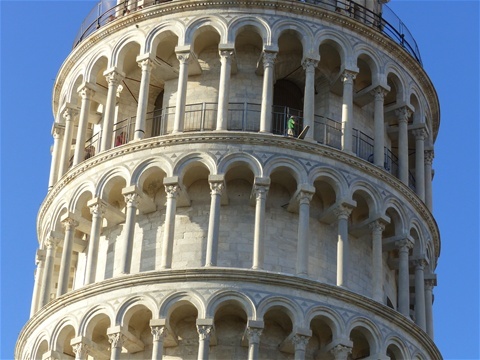 A wonder of the world, it did not disappoint, and we knew we were in for the time of our lives to have our feet on Italian soil and to be treated to seeing the art, architecture and the cuisine that is celebrated world wide. Yes I'm a singer and I am mostly interested in the music, but believe it or not, an Interior Designer is educated in the antiquities and I have longed to see these places for over 25 years, since first being exposed to the history of this beautiful and special country. 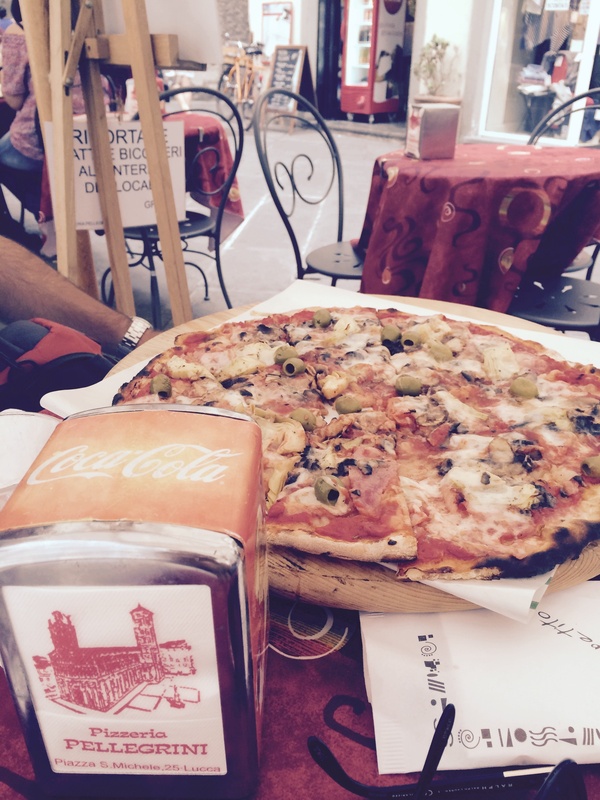 Only about 35 minutes away, we were soon in Lucca and THIS was what it was all about! I had never even heard of this town before, and suddenly I was in Puccini's birthplace, a walled city with all of the modernities but still retaining everything about its Italian beauty and authenticity. We walked, searching for a restaurant with nice chairs (?? Why, you ask? Too many hours in planes and automobiles and such!) We sat down at a nice spot and were made to move because we were at a table for 5! And we were moved to the back of the area, on tiny little chairs with no cushions, and smokers beside us. (Sorry smokers, Euro cigs are just not that nice!) 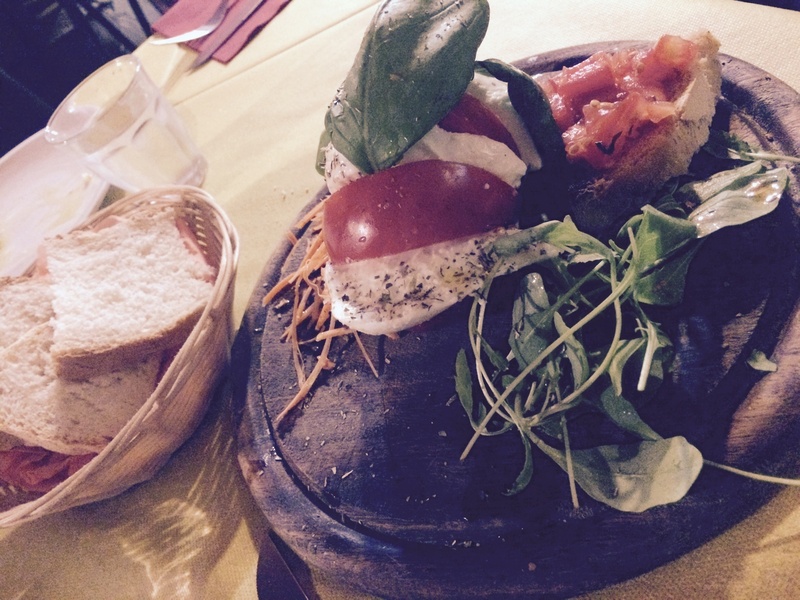 I wanted the Caprese salad and they served it with a twist, the whole tomato just partially cut through and with great wedges of buffalo mozzarella tucked into it, a huge sprig of basil on top and on a cutting board. Some nice bread was also brought to us, and this time, not just olive oil, but also the requisite balsamic vinegar, the real stuff! We devoured it! Our menu choices were made out of a desire to eat something truly authentic and Aris chose Gnocchi and I chose the special, a fresh pasta dish with ground sausage and truffle oil. We ended up swapping part way through and let me tell you, the Gnocchi was absolute heaven! It was served in a cradle of crispy cheese and with a cheese sauce. Aris liked my noodles better and I liked his Gnocchi better. I would go back there, just for the Gnocchi! We did not order any wine at all, satisfying ourselves with water. By the way, we fast learned that bottled water comes two ways, Frizzante and Naturale, as we picked Frizzante by mistake while we were in Pisa. "No Frizzante for me, para kalo!" (Oh, that's Greek.) "Naturale, per favore!" That's better. Our hotel was great, all of the staff were pretty much fully bilingual and patient with our Italian efforts, helpful with maps, where to shop, where to eat, and where to find Puccini's house. The next morning, after our hotel breakfast, we had to put money in the parking meter outside of the walled area, and then we took a lovely walk atop the wall. It was built in the early 1500's, to keep marauders out. I am sure it did the trick then! We then found a spot to sit and have another coffee, and I ended up ordering a tray of cheeses and honey, which came with some small pieces of bread. The assorted cheeses were sweet, creamy, peppery, and spicy, all going very well with the bread and honey. We found Puccini's house easily and made sure to take the important photos! Any singer would want that. I gazed up at this handsome man and told my husband that if I'd been alive in a different time.... (but then I remembered about Mozart!) haha. I had once commented to Aris that I would have wanted to be Mozart's muse, (or one of them) and he replied by saying that as it happened, an elixir he once took for his deafness actually had made him immortal, and here he was, in the flesh! Um, no, I said, "You are Beethoven, then!" At least he tried, and we had a good laugh! Tuckered out, we headed back to our hotel and guess what, Aris snoozed. But it wasn't long before we mustered up our energy again and went walking some more. This time, we explored a Cathedral and then wandered the streets, looking at all of the shopping. For dinner this time, a pizza was in order! So we found a very small place that a tiny patio space and sat there. Pellegrini's! The pizza was mouth watering, with artichoke hearts, funghi, olives and ham. No PakiTaki to take home this time! We then wandered back to the square in front of Puccini's house and grabbed a gelato, sitting and admiring the composer once again. A little kid that was part of a tour actually climbed up and sat on his lap. I had wanted to do that! But figured it would somehow be disrespectful, not to mention inappropriate for a 50 year old woman to do..
After our relaxing little stay in Lucca, we had been planning on heading for more relaxation and some hiking, in Cinque Terre, a wonderful coastal setting where there are 5 uniquely different villages all set upon the cliffs, and within walking distance of one another. The photos I've seen have been inspiring and for years I've wanted to go. It wasn't in the cards for us today though! A thunderstorm awoke us and while it was only to last for about half the day, we had already started talking about skipping Cinque Terre, because through our web searches, we had not been able to find a room! 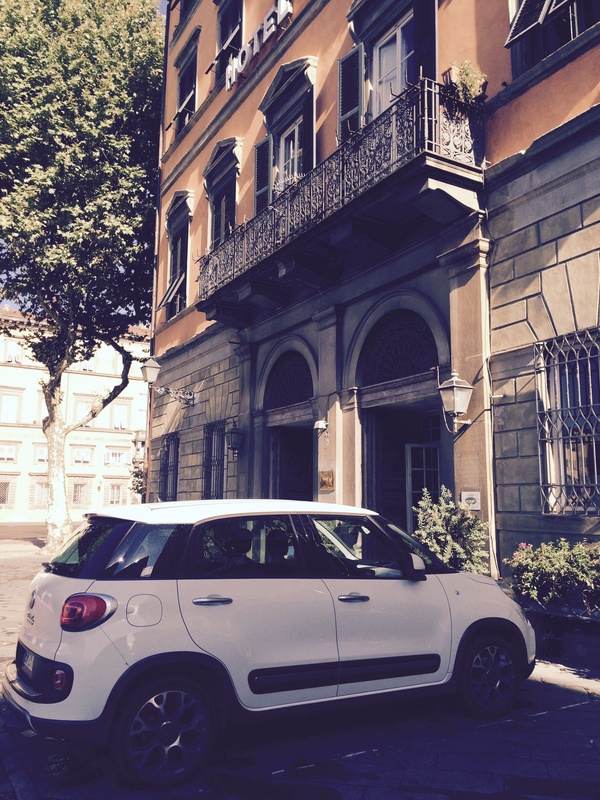 So we packed up our little Fiat and hit the highway for Florence. We did not have a reservation here either, but figured that we'd find something in short order. What really happened is that we arrived in the city at around 11am and figured we'd park the car and walk about a bit, inquiring in a few hotels to see what we could get. The first one was a no, so we walked a few blocks. The second one said yes, and the rate was a reasonable 75 E, but we would have had to switch rooms after the first night. Then we moved the car, as it had been in a delivery zone. Heading closer to the Centro, we found two things out fast: You cannot drive your car into the Centro and once in, there is really nowhere that you are permitted to park. Oh, and the third thing, no rooms! Back we went from whence we came and parked (probably illegally again; the first illegal spot just happened to be directly outside of the police station!) next to a little park, and walked again. By this time my head was crying for caffeine! Up a few stairs and one was closed. In a lovely door and voila! We found availability and booked for 2 nights in Hotel Cellai. The lady behind the desk named Shona, was from St. Andrew's Scotland and spoke to us with a lovely lilt - we felt like we were home indeed. Hotel Cellai is a super little boutique hotel, as mentioned in the previous note, no worn out seating here! I wanted to spend time sitting in the bar and lounge just to soak it in, but Aris wanted to go to our room. He can always fall asleep, and I cannot. I should have left him there and gone down to the 'Honesty Bar' to have a sip and to type some emails. (Yes, I'm doing some work still, long distance!). Now, I don't even know where to start in terms of how I feel, being in Italy for the first time in my life. It's a little overwhelming! And I say this because of the emotion I feel, setting eyes upon so many important and sacred things, all at once. 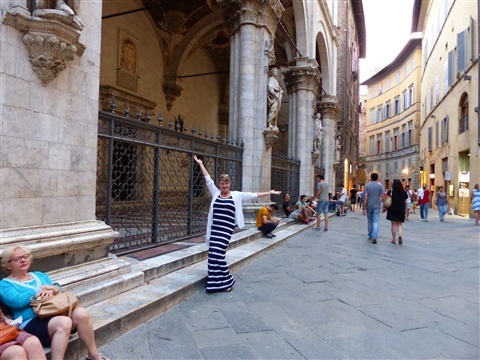 We walked through several small streets to get to the heart of Florence where the Basilica stands. It is the famous Cathedral of Saint Mary of the Flowers. I did not expect the sight I was to behold, coming around the last corner. Up arose this incredible wall, the side of the Cathedral, so high it took my breath away. And so ornate, that I couldn't believe my eyes, at the workmanship. Walking almost all the way around, I had no words, I could not speak to my husband, I was choked up. Such a weird feeling, when your throat closes and the eyes fill with tears but they just sit there, not quite falling. Such beauty! Such glory! Three kinds of marble were used to create the incredible colours, the white Carrara, green from Prato and red from where else, but Siena. Of course! The Italian flag is formed with these three precious colours, their earth, the rock upon which the great country is built. Lit up at night, it almost looks like a drawing, with water colours added. The walls are three to four feet thick, as is evident when one gets to see the construction of the rose windows. We walked around the entire building and then went inside. It is massive, again overwhelming, and one must be ever so quiet. You must be covered properly, and cannot use flash on your camera, but you can certainly take your time to gaze at the artwork, the sculptures, the windows, the altar, the crucifix, and the memorial candles. Lunch was to be found down a side street just around the corner from the Basilica, unfortunately with no view of the basilica building. Dell Olio "Tuscan Chic" is in a shady spot and has welcoming chairs, and the menu looked enticing. We decide to share only two things, a Caprese salad, and a fresh pasta dish with sliced truffles and tossed in a light oil sauce, with pieces of smoked goose hidden underneath. A bit salty, I really liked it though. Aris was horrified when I cut the pasta into bite sized pieces. Sorry, to all Italians, to whom this would be considered sacrilege! I will try not to do it again. We walked and walked and walked, and stepped into a few other churches to look around, and later that evening ended up in a large square where we had dinner. I don't know why, but we were at a Polish restaurant in the middle of Florence. haha. What did I get? A GIANT grilled pork chop, at least an inch thick, which came with what was supposed to be caramelized onions, (but which were actually pickled red onions), and I quite enjoyed it. 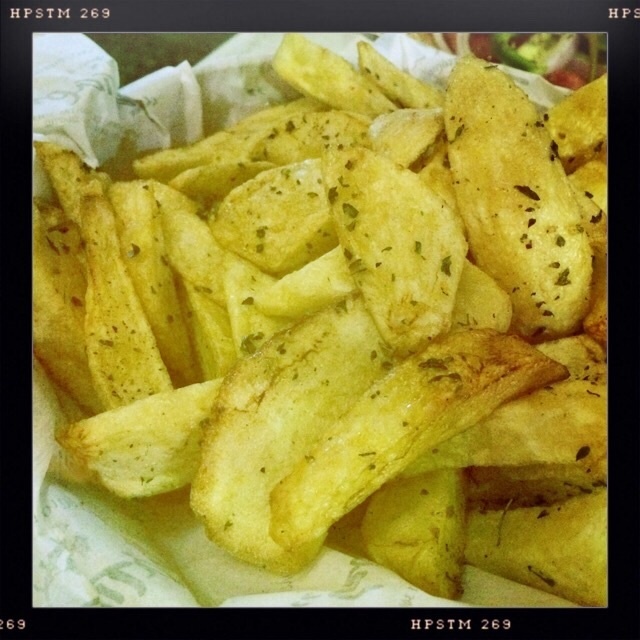 We shared some fries at this meal and they were excellent too. The square we sat in was the Piazza del Repubblica and a great arch was within my view. That was enough for us, the end of our first night in Florence and the bed was beckoning. 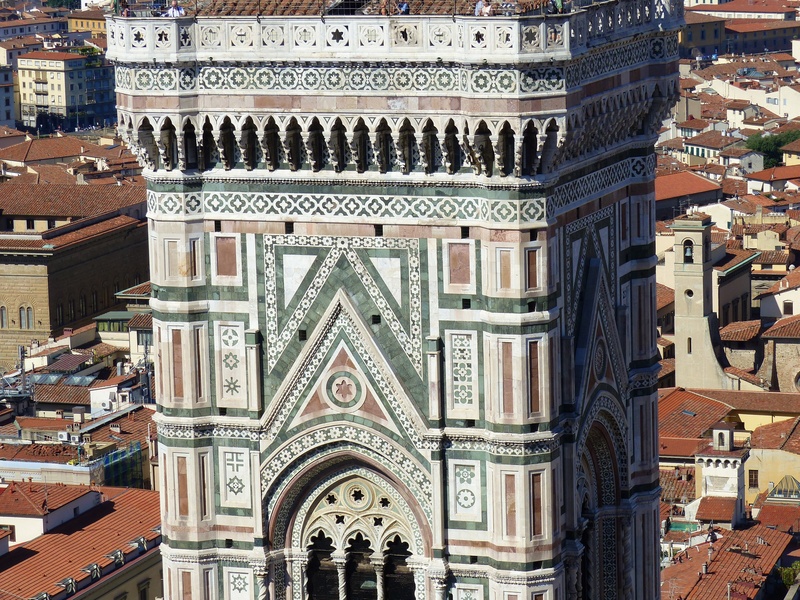 In store for us tomorrow would be the climb to the top of the Duomo, something we needed to recharge our batteries for! Today in Florence I had a lady ask me where I got my scarf. I have had this scarf for over ten years! It has traveled with me to many places, including India, Greece, Mexico, Bahamas, Paris, Scotland, Shetland, and now Italy. I wear it many ways and almost always receive a compliment on it! It covers a restaurant chair when I don't want the imprint of wicker on my bare legs, or when I don't want to stick to a vinyl seat. It shields me from the sun, and is actually heavy enough to keep me quite warm, on those chilly mountain evenings in the village. I bring it to the beach, and wear it to hide my belly when I go to the cafe! I wear it draped over one shoulder often, just to carry it around without effort. Or I tie it to one side, or it is wrapped about my shoulders, as I had to in India, in order to be respectful to the Muslim Faith. Today, it allowed me access to the great Cathedral of Santa Maria at the Duomo, because wearing my short little shorts, I would not have been allowed in, so it became a knee length skirt. While I must have over 20 different wraps and scarves, this one is by far my favourite, the most versatile, and the best colour mix of all; it goes with everything. 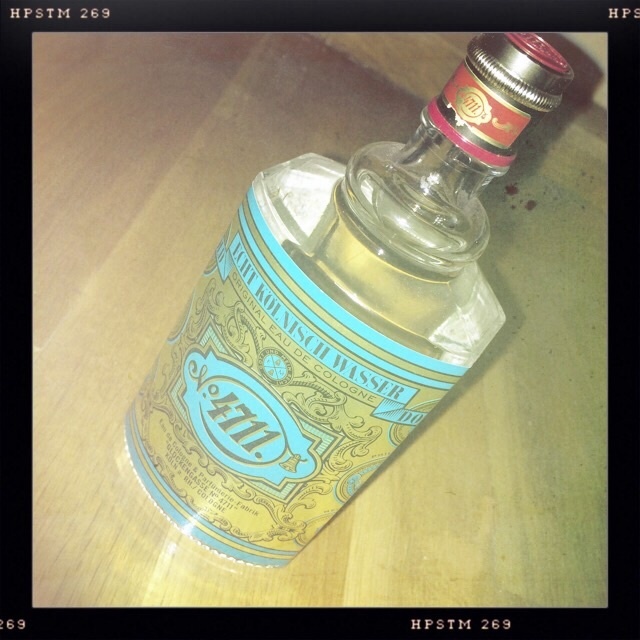 I don't know exactly how I got onto this scent, but I bought this bottle a few years ago at a Duty Free, since that was one of the last places I had been able to even find it. 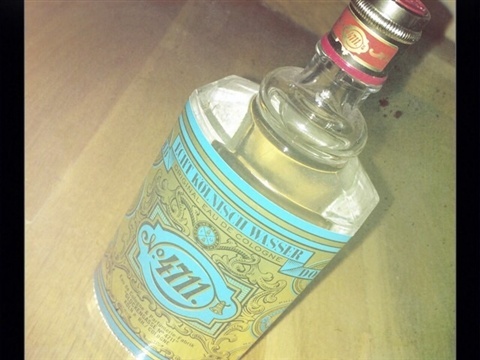 It is the original Cologne, from Koln - and the lightest, freshest scent I have ever worn. Perfect for hot summer nights, I decided last year to bring it to Greece with me, and to leave the bottle there, so that others who visit could also use it. I think my Mother used to wear it when I was little. Why else would it resonate with me so much that I would seek it out? Finding our Hotel this morning proved a bit challenging. Okay, so it is exciting to head to your destination without knowing where you will stay, some people do this as a rule. We are generally spontaneous and easy-going people. Today however, the stars did not align, quite at first. Driving into Florence, we did not know what we'd find and hadn't done any legwork beforehand. We missed out on Cinque Terre because of this, but may double back there after a few days in Florence. At any rate, it was sort of like wallpapering, the true test of a relationship. We got through it! And ended up in the most well appointed boutique hotel I think that is even around! The Interior Designer in me loves it. There is no tired, worn out looking furniture here. The space provides a surprise around every little corner! Maps, sketches, and old photographs line the hallways and stairwells, several seating areas are on the main floor, including a lounge, a bar, a piano room, and a breakfast area. And on the rooftop, a garden with a view of the Duomo! 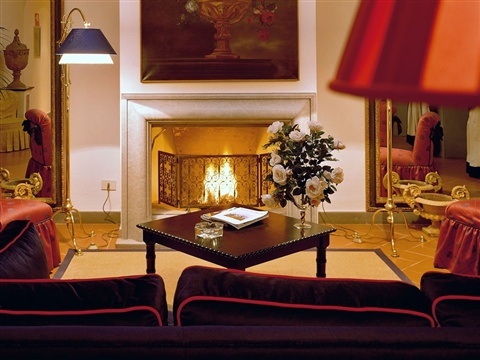 Yes indeed, our stay in Florence will be heavenly. Oh, and the crowing glory? A really nice mattress!! We made it back! 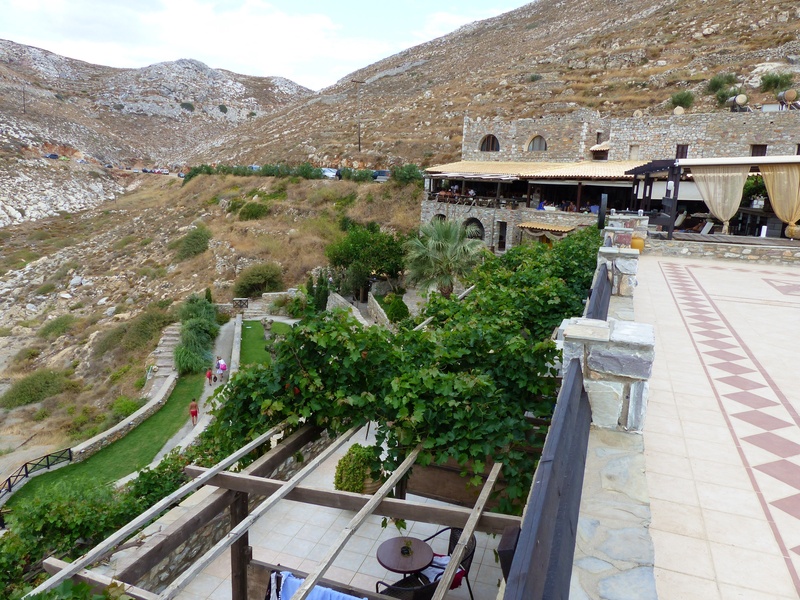 Last year, after a long exploratory drive through the mountains and coastline near Areopoli, we discovered a gem of a resort, tucked into an alcove that is surrounded by peaks on both sides. Marmari Paradise seemed very interesting to us, but we had not prepared to stay the night anywhere, so we tucked it into the archives of our dusty old minds and tried to remember to seek it out again some day. Aris's mind remembered perfectly, where to find it, and off we went this morning, to see if we could stay the night. Part of the adventure, I guess, is to set out without really knowing the exact outcome, and we did not have a reservation. 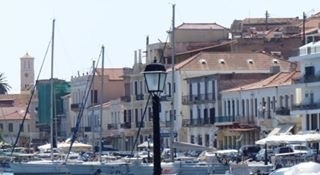 I had to do some banking this morning and so we stopped part way in Areopoli so that I could connect to wifi and just get that done...make sure that mortgage payment goes through! The cafe we chose was one we had visited in the past as well, both with the boys and just on our own last year. I had eaten breakfast, and did not want a Frappe, so instead, I ordered the next most logical thing, a huge waffle, smothered in Nutella and topped with chocolate ice cream. It was not even 11am! Oops. 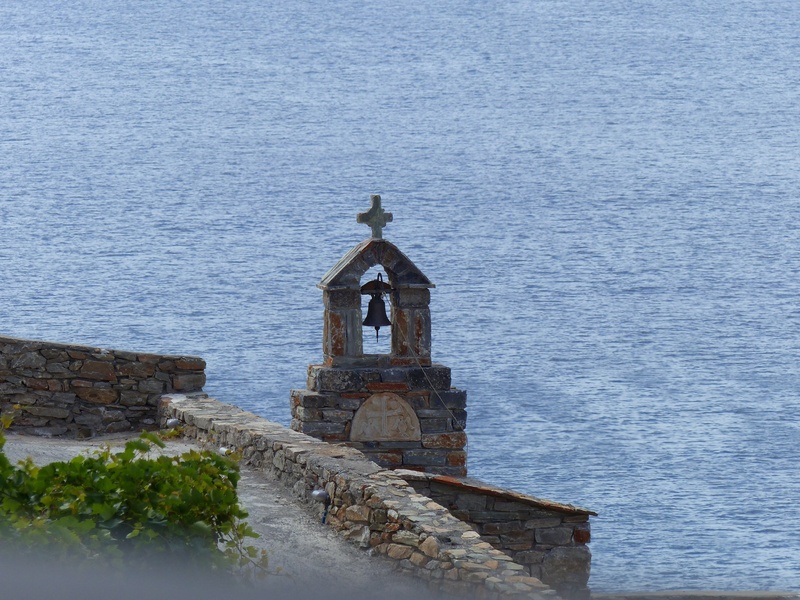 We've learned a bit about Areopoli over the years, in particular that it was the site of a huge organized resistance to the Ottoman occupation, led by a village elder by the name of Mavromihelakis. 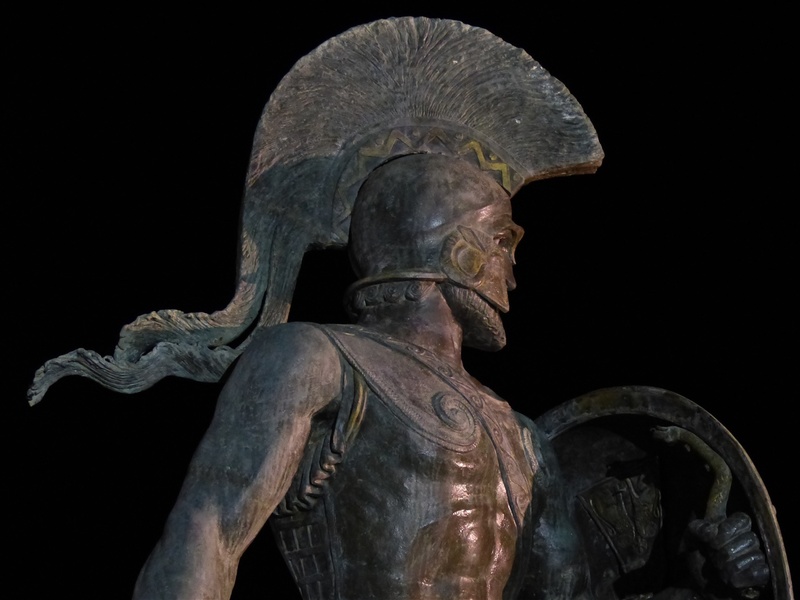 He is immortalized by a fantastic statue in the square and also referred to in the local museum. Rumours also swirl that the area was protected fiercely by the Mani women. Mani is the Region that Areopoli is in, where the women are renowned and also immortalized by a statue down by the Caves of Diros and even have a very distinct look to them, the older ones always clad in black and with their kerchief the way we seem to typecast all Greek Giagias to look. The buildings and streets of this particular town are incredibly beautiful, stone streets and curved archways, bougainvillea gracing the doorways, and lovely bright mediterranean colours painted on the doors and shutters. The newer houses are still built in the same style of the Mani Castle, a tribute to times of old. Arriving in Marmari about an hour later, upon first asking if there was a room available, we were told no. Aris knew that this was likely not the case, so he carefully said that we would be patient and stick around a bit in the event that something would come available later in the day. In a few minutes, the fellow said they did indeed have a room, and it was the last one. In fact, the room was made up and ready to go, so we took our stuff right in and got ready to visit the beach. It was going to cost 70 Euros and would include breakfast. The rooms are built on the side of the cliff, in three tiers, ours on the middle one, and at the end of a row. The front opens up to a private patio (no one will walk past ours to get anywhere else) with a spectacular view of the beach and the swimmers below. 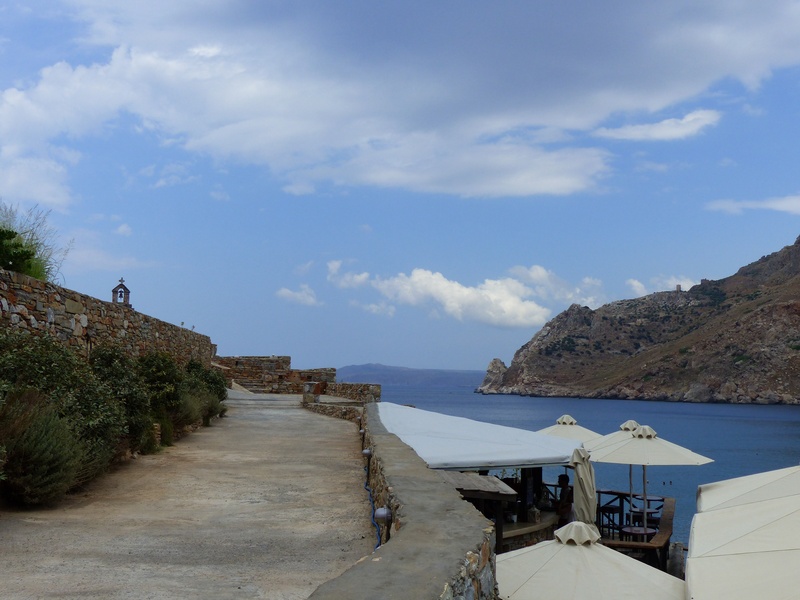 There is a beautiful restaurant and also a beach bar, situated about half way down to the beach. We sat in the restaurant when we needed a break from the hot sand and sun, but avoided the bar because the music was too loud. Now before you say anything, yes, I have become my mother! :) And anyway, even if it had been nice classical music, how could I have focused on writing anything. Complete (or close to it) silence, please. It's a very sandy beach, with a nice gradual slope leading down into the water, and then seems to be fairly shallow for quite a way out. We waded in twice and some great waves were rolling in so we bobbed about a bit and listened intently to some Italians who were having a lot of fun right next to us. Back in the room, Aris is taking a snooze and I'm typing this on the patio, after having rinsed out our suits. I am anticipating dinner, as the restaurant appears to be quite an establishment. We shall see! Time for a nap now, all the fresh salt air and sun demands it of us! I actually slept too, until someone's snoring awoke me. We got dressed up a bit and headed out for a walk. Behind the resort it looked like there might be a small village and we wondered if we'd find any little shops that browse. There were none. Not even a variety store. There were at least two more with this one to rent but none that could compare with where we were, in particular the view and ambiance. Now, we are not fussy travelers and don't go about thinking we need only the best, although we've had our share of nice high end accommodations over the years. I am not one to complain and I know the expense of fixing every little detail, and the choices that have to be made when considering a maintenance budget. For me, it's acceptable to stay if the sheets are clean, towels are available, extra pillows or blankets can be had, and, that I can adjust the temperature. And I always inspect for bedbugs. Security too, is important, of course! Haven't you noticed dampness, or a bit of dust, and passed it over? Or a less than stellar mattress? (Don't get me started on mattresses in Greece, ok? After one week here I need a chiro adjustment and a deep tissue massage! We are going to invest in a pillow top for the mattress in Petrina, so my old hips don't seize up!) The point is, that we more often consider where we are and the purpose of our visit, than to be overly concerned with too many high expectations of our accommodations. So, I might mention something if it is deplorable, but won't generally complain. I liked the room, didn't like the mattress, and the little fridge had some rust on it. Didn't stop me from loving my visit!! I will add a little video below so you can see the room first hand. After our walk we sat down for dinner in the upper level, overlooking the water. The menu offered a few things we hadn't seen yet so we dove right in and ordered a grilled cheese called Haroumi, which was served with fig marmalade. Yum!! Asking the waiter what else they had, we learned that they too had Kokora, and remembering our Petrina meal we got pretty excited! It was good, served with spaghetti, but it didn't hold a candle to the village Kokora that is described in the last blog. Breakfast the next morning was the standard fare of hard boiled eggs, yogurt, honey and bread that we could toast ourselves. We wanted it at 7am... And it didn't open until 8:30! I was dying for a coffee. We were expected back in the village for the celebration that evening so we headed out after another quick swim, this time taking the coastal route and winding in and around the hillsides to the southernmost tip of the Peninsula, called Porto Kayio, where there are some ruins of the Death Temple of Poseidon, and apparently a Roman mosaic. It was about 40 degrees so we did not hike out to it, but turned around and 5 minutes later we were in the seaside village of Porto Kayio itself, where several yachts had moored for lunch. We had a wonderful lunch of Grilled octopus!! Agria Xorta, which is a wild variety of the Xorta greens that I've described before, and yet another Xoriatiki. Honestly, when you know what this salad is like, and you crave it long distance for a whole year, one cannot get enough of it, ever! 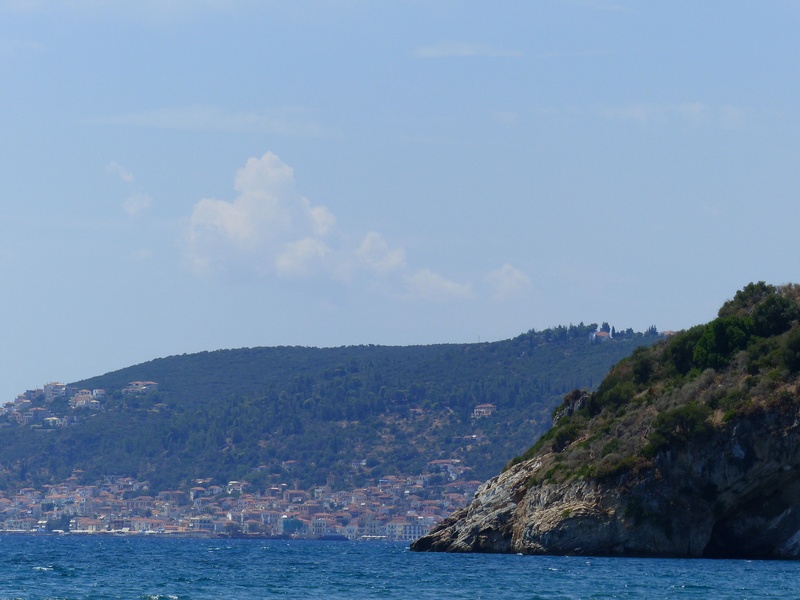 Porto Kayio is a very scenic spot, perfect if you know how to sail. I wonder if I can talk Aris into some sailing lessons and ultimately get a boat some day?? Heh heh. Next blog - will be a bit about the Panageia celebration up in the village. But right now, we have to get on our flight to Pisa! 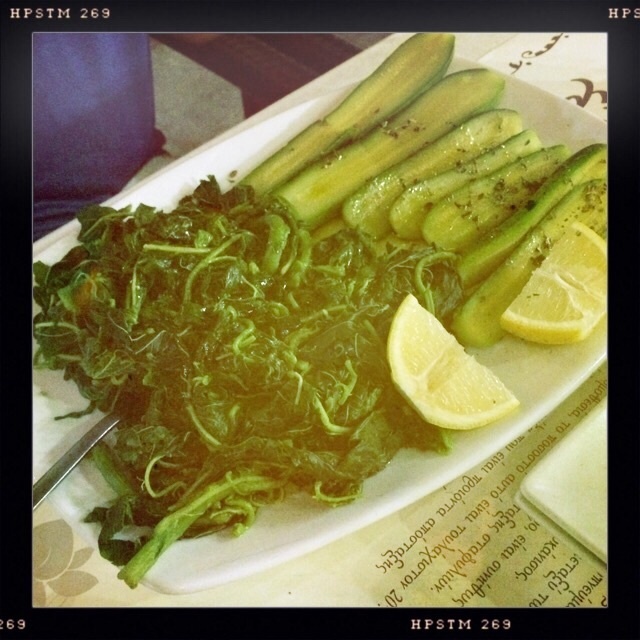 Kalo Taxidi to us! Porto Kayio Octopus! Perfectly done! Today once again the fabulous coffee helped us awaken from our long sleep. Unlike the night before, there was no loud music being broadcast from the Platia in the heart of Petrina. 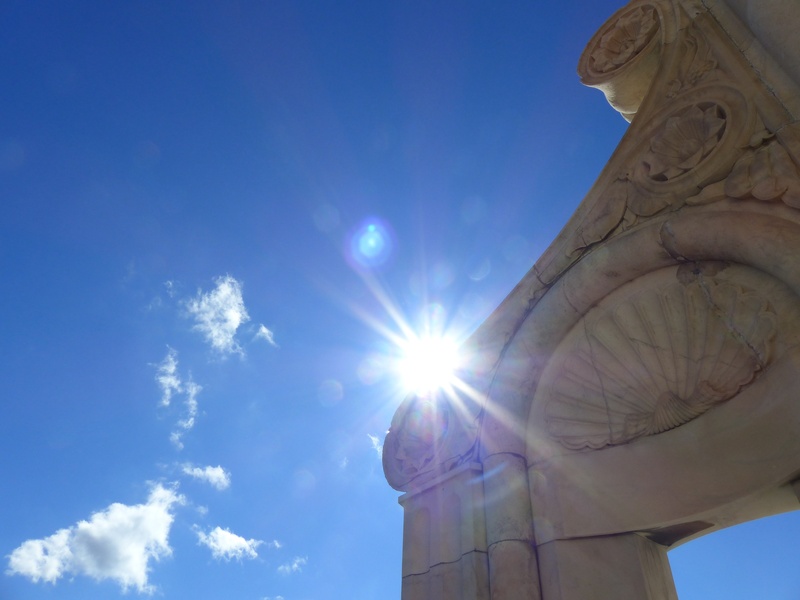 That evening, there had been a preliminary celebration, leading up to the great feast of August 15th, a special day for all Greeks when they celebrate the Virgin Mary. From afar it sounded like some great Bouzouki playing was happening, and the voices weren't half bad either. :) Drifting in and out of sleep, we would hear snippets of music, and then every hour the church bell would count the time out to us, and we would count along with it, in a drowsy state, awakening again when it chimed the half hour. The wind cropped up and this having been a long adventure already for Aris's Dad, we headed out at about 2pm. They are all sleeping now...and I am plotting on where I am going to find that Gyro, once and for all. After showering and relaxing a bit at the house, and a visit from the people who live downstairs, sharing our Karpouzi (watermelon!) with them, Aris and I tried to decide where to head for dinner. It's a process - we go out in the morning, have coffee at Touristiko down in Gytheio, hit the beach, have lunch, come back to the village, clean up and/or sleep a bit, and then figure out what we want to do for the evening. I have finally adjusted to the schedule here. &nbsp;You don't go looking for something before a certain time of day. &nbsp;People don't eat dinner until starting at around 8pm. The reason is simple. The heat can be exhausting and in the afternoon, they rest. 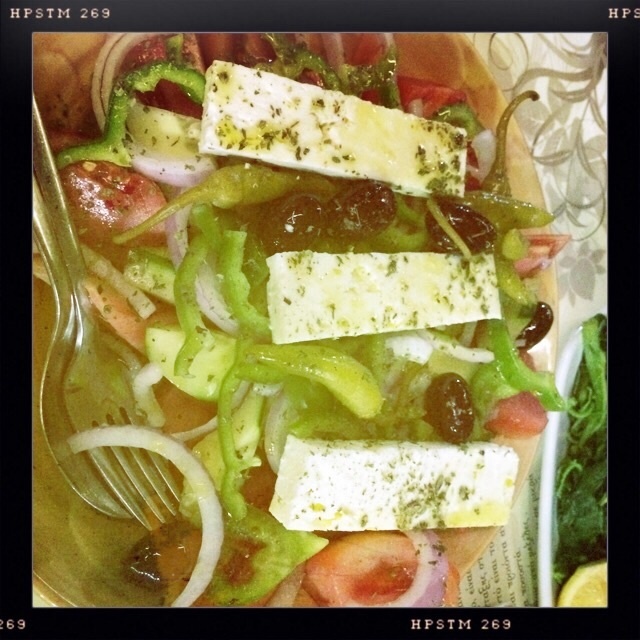 Then, liveliness comes back, the dinners start, the Platias become the place to be and to be seen, and the music and dancing can go into the wee hours. We were not sure whether Aris's Theo (Uncle) Kosti would be available, but we decided to head up the mountain to Arna for dinner. It is about 15 kms, but it takes almost 30 minutes to drive it, because of the winding mountain roads. &nbsp; We passed through several other smaller villages on the way there, but Arna is an actual 'destination'. I had a bit of a discussion with Aris on what other villages we've passed through, that are such authentic, unpretentious attractions. [We came up with one other, which we had found a few years ago, called Langadia, high in the mountains near Olympia.] &nbsp;Arna has much to offer, as it is on the second highest peak of the Taygetos range, and has a stunning view right down to Gytheio and of the surrounding mountain tops, a generous and charming Platia, the centre of which has the largest Plain Tree I've ever seen, and also some surrounding shops which are full of handicrafts, and a bakery. I only took one iPhone photo of the Platia last night, but will dig up my better photos from last year and post them in a slide show below. On our way back down the mountain after dinner, I perked up again, watching for wildlife along the side of the road. &nbsp;I think we actually saw what would have been a small pig or a boar, waddling off into the woods! At one point, we stopped, turned off the van completely, and just took an awestruck look at the stars. Milky way and every constellation you could imagine, was seemingly hovering just within reach. Incredible!! The coffee we have up in the village has become our special tradition. Mom tried to get us to brew regular coffee in her coffee maker, but we both insisted that we percolate some Greek coffee in her old Corningware pot. It still works perfectly, bubbling up into the glass lid when it is ready, but the lid is a bit loose and I have to be careful not to burn myself with the steam. Aris makes it better than I. It takes a long time but the result is strong and sweet and is truly the best thing that we taste each morning. I add 'Noy Noy' to it, which is a sweetened condensed milk, and oh so good! Sitting on the balcony which wraps around the back of the house with a view of the mountains, we often have our coffee as the morning coolness subsides and the heat begins to descend, the tzitzikas beginning their sonorous hum. We finished the rest of our unpacking, showered, and headed for the beach. Our favourite beach in all of the places we have visited so far in Greece, is just outside of Gytheio, and is called Glyfada. It is sandy and warm, with a gradual slope into the sea, a view of cliffs in one direction, Gytheio in the distance, mountains on the other side that reach down to the tip of the Peloponnesos at Elafonisos and Neapoli, and a shipwreck that purportedly was left after being run aground by some smugglers, some 40 years ago. 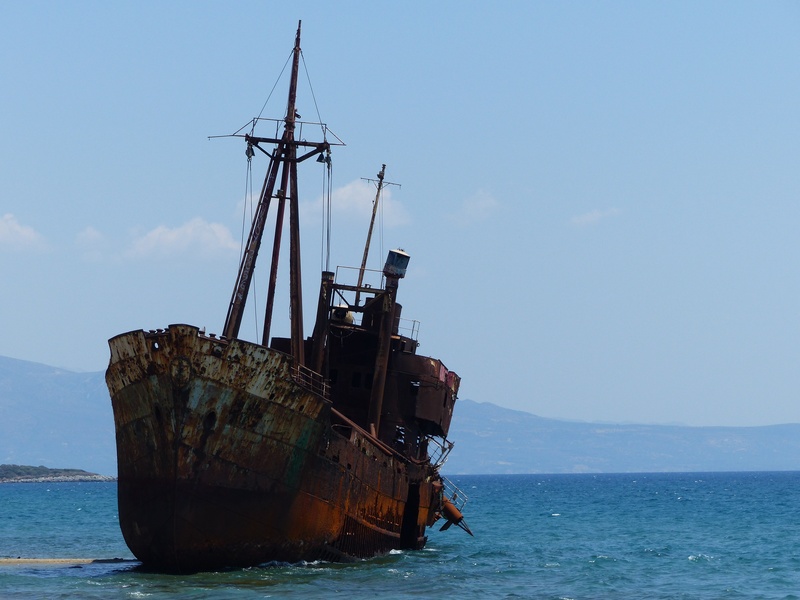 We have watched it disintegrate over the years, each time it seems to have sunk lower into the sand, and is now tipping precariously, with its hull completely rotted through. There are signs warning swimmers not to approach the wreck. It provides a wonderful addition to the scenery around it, but one day, we figure it will have to be towed away. If one walks past the boat a little further down the beach, there you'll find flat rocks with little tidal pools to investigate, and you will be quite alone as a couple. Glyfada beach has a restaurant and bar that is shielded from behind by the cliff, and sits overlooking the sparkling waters with the view of the ship and of Gytheio. It was busy today, so we ate a little later than the lunch hour, having had a late breakfast anyway. We sat first at the bar, where they play pop music and serve only drinks...and they have wifi available. So, the requisite first photos were popped up on Facebook, as we enjoyed the first Frappe of our trip. 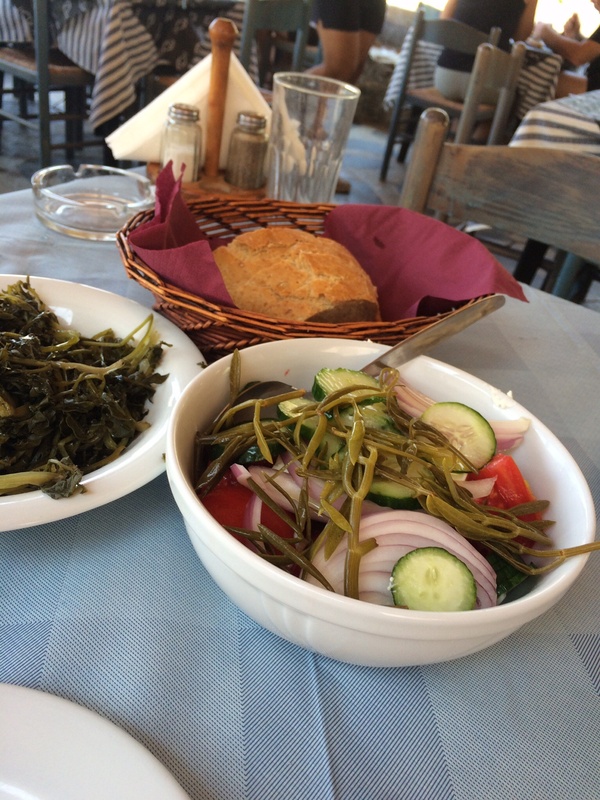 I ordered in Greek, as my husband had gone to the men's room, stumbling over my words and laughing with the waitress as she repeated my order back to me in English. After soaking in some sun, and swimming and floating around for a while, as well as time spent snapping a few quick photos, it was time for lunch. Again, it was Xoriatiki, with rustic bread and olive oil, and this time we added calamari. Of course we should have had it grilled but we knew that this particular place offered a lightly deep fried version, fresh and tender. There is no rubber happening here! It was served with half a lime and this is a wonderful, savoury addition to the dish. Perhaps we paid a bit of a premium for this meal but it was well worth it this time, and we will be back. For the salad, and calamari, and only water, I think we spent around 19 Euros. Aris explains to me that bread, while not really noted on a bill, is included by virtue of a 'seating fee' which usually amounts to about 1,50 Euro per person. And tipping really is not expected, a tip is generally built into the price. 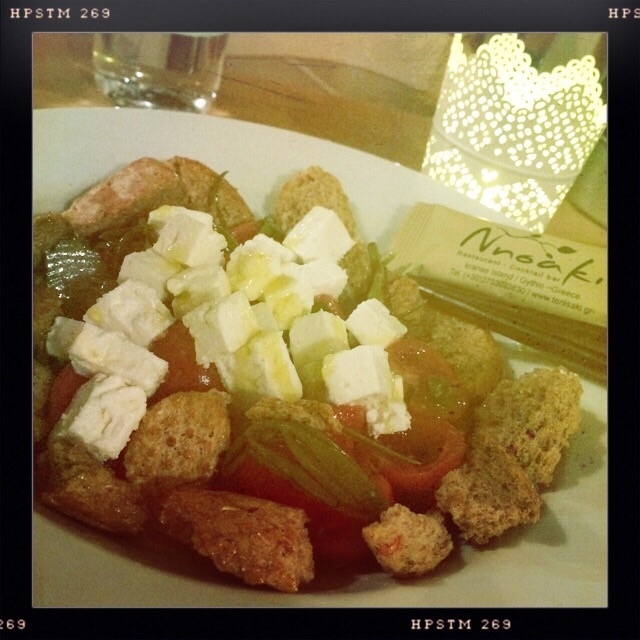 At any rate, they offer a full menu, including Moussaka, stuffed peppers, and more. Some of the best food we've sampled, has been at this location. &nbsp; It is likely that our tastebuds are somehow titillated also by the view, making everything seem that much more sumptuous. We didn't last long at the beach today, still jet lagged a bit, and worrying about our parents back in the village, so we were heading home by about 4pm. 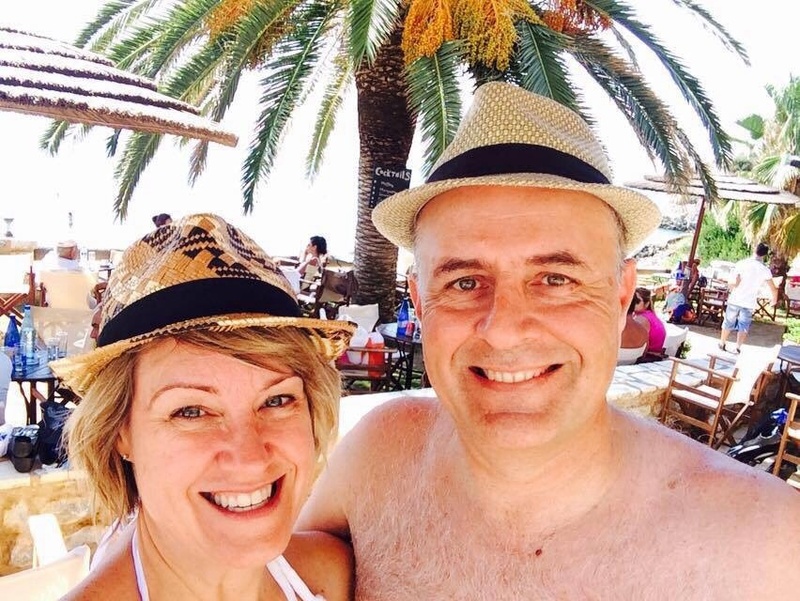 Below is a wee slide deck with a few photos from Glyfada Beach and Gytheio. "We make it differently here", he said. Ohhhh yeah!!! 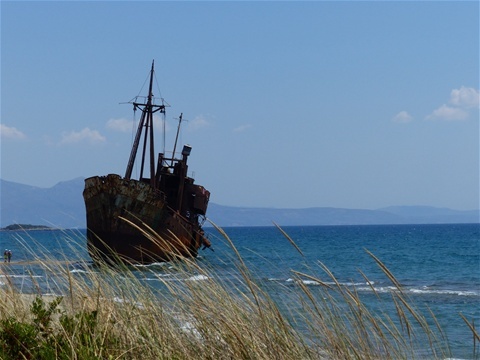 The famous wreck that makes this beach particularly scenic. Aris chases our umbrella as it flies away again! 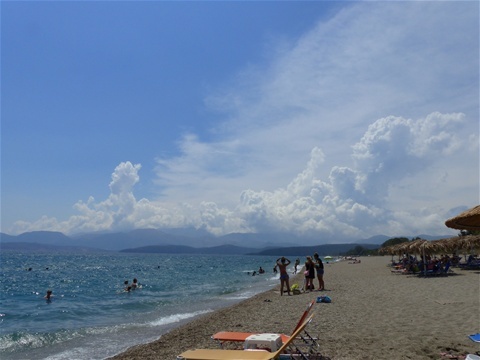 View from the beach, across the bay to Gytheio. 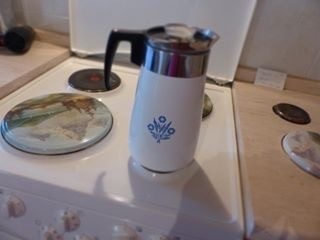 The percolator! Blast from the past. Our fun begins in Greece, on our 5th trip together to this beautiful place. 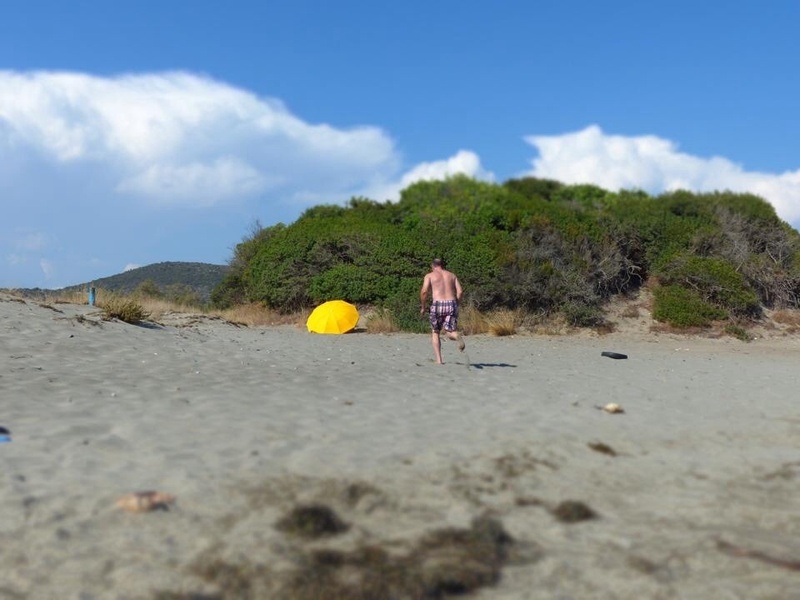 Lucky to have family here and a homestead to hang our hat, in the Pelopponesos Region, we have driven from stem to stern of the South Central Part of Greece, and have yet to explore more of Northern Greece.